This entry was posted in abuse, abused children, ACX, amazon, amazonbooks, artist, author, author interviews, authors, blogtalkradio, books, books that matter, business, Children and Domestic Violence, corruption, createaspace, diannabellerose, diannabelleroseshow, domestic violence, educational, empowerment, enterteiment, Equality, family, filmmakers, Happiness, human trafficking, lessons from life, love, motivatiional, Motivational, radio for women, radio interview, Religion and Spirituality, STOP Domestic Violence, violence against children, webinars, women, women for a change, women stories, World free of Violence on February 15, 2019 by diannabellerose. Hello, my name is Lewis. I have known about my targeting since October 2016. I have come to know a lot about the targeting over time with the many people that I have spoken to and wish to keep speaking to people and meeting new friends inside the TI community. I also helped bring together the August 29th 2018 TI Day global protest event and I am here to share and spread the news about a new event coming up in April 26th through the 27th of 2019 called the Targeted Individual Springtime Rally. I hope you all join this event has a focus location which is in Sacramento, CA. This Rally will be for people around the world and different locations in the U.S. If you are on Facebook, please visit the TI Springtime Rally page. Hope to hear from you.? This entry was posted in Uncategorized on January 18, 2019 by diannabellerose. Mike Conan was born and raised in California, and he currently lives here. He almost lost everything until Ihe figured out what they were doing when he did a little researc. Someone helped him, so he did a complete 180 and now everything is going good, but he currently still have the v2k? 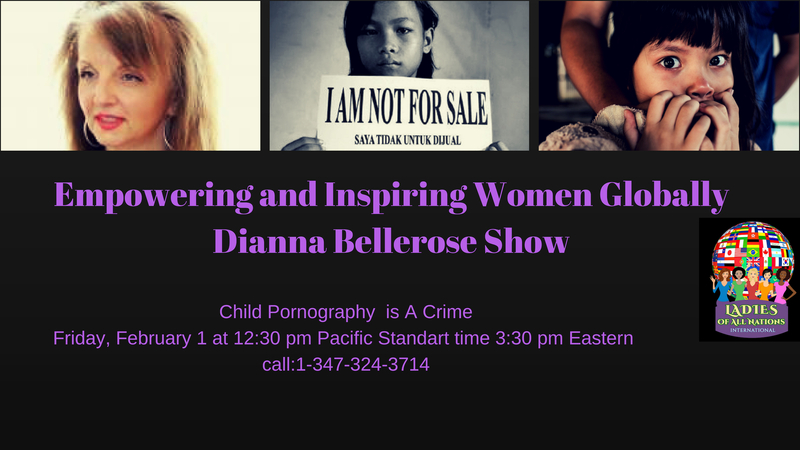 This entry was posted in author, author interviews, blogtalkradio, books that matter, corruption, diannabellerose, diannabelleroseshow, educational, empathy, empowerment, enterteiment, lessons from life, life, lifechanging, motivatiional, newworld,, radio for women, radio interview, religion, religion&spirituality, ture story.diary, Uncategorized, women for a change, women forums, women stories, womenenterpre, World free of Violence and tagged corruption, crimes, drugusers, humanrights, humansacrifice, religion, targetedindividuals, violationofahumanrights on January 18, 2019 by diannabellerose. Do you believe you can change the world with your words , thoughts and actions ? Change starts with you , your change can inspire someone. We have the chance to turn the pages over and make a change. The mission is to campaign for the voiceless and give them a voice , raise awareness and influence change. This will enable us to create a change for the most vulnerable people around the world. Your campaign could be anything from raising awareness regarding something you are passionate about, dedication to a family member who has been through challenges or going through challenges, dedication to a loved one who has Deceased or going through terminal illness , health & wellness , Encouragement & Support ,something you have been through and sharing your experience or sharing your success and triumphs. This will be to inspire someone as we unite our voices for a greater impact with this campaign. The target is to change the world and unite people for a great cause. You can use your campaign flyer to Spread the word , raise awareness and find your voice to transform lives by empowering others around the world through this campaign. The mission is to use our campaigning to give a voice to people and influence change. Everything changes when you change. We must change ourselves first if we wish to change the world. If you want to change the world, starting with yourself is the first step. Let’s use our voice , to change the world and start Uniting for a great impact. Unite to become one Voice . The more we can come together and raise awareness, The more we can help and support others. We have the power to change the world around us. This entry was posted in ACX, author, author interviews, authors, blogtalkradio, books, books that matter, business, celebraties, Children and Domestic Violence, childrenseducation, coaching, diannabellerose, diannabelleroseshow, educational, empathy, empowerment, enterteiment, Equality, Inspirational, international women’s day, motivatiional, Motivational, Uncategorized, women for a change, women forums, World free of Violence and tagged women, women for a change, women in business, Women Leaders, women overcoming obstacles, womenfromallnationalities on January 7, 2019 by diannabellerose.